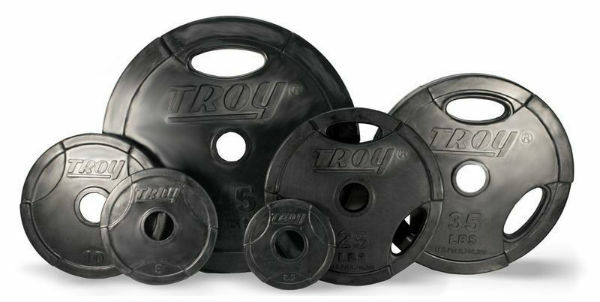 Troy makes several models of free weight plates. I’ll go through them in order of popularity, so hopefully you’ll find what you want near the top. At the bottom I mention the ones that, IMO, are not worth getting. I’ve inspected all of these plates personally, either as samples or in some cases kept using them for years. The prices are pretty close for most of them, so price shouldn’t be the deciding factor except if you want the absolute cheapest plate (in which case you’re probably not bothering to read this) or you want the absolute best, which would be urethane. Other than those, it’s more about what features you like and dislike. Weight is weight, but if you’ve been around them as long as me, you get to know them a little better. 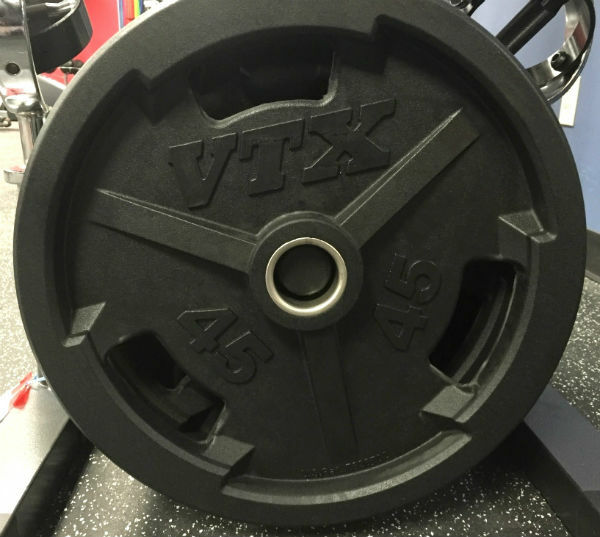 This article just reviews some iron and coated plates, not the solid rubber bumper plates, which are a whole different category. Troy on their website calls these their “wide flanged plates,” or the HO and PO models. Grey and black, respectively. Other than the finish they’re the same. There’s a lot more to them than that, but indeed the first thing you notice in person when physically comparing them is that the flange (ie: the rim) is wider so is easier to hang onto than their economy weight plates. Nothing ruins your day (or year) more than dropping a plate on your toes. At least as far as gym activity goes. The other big feature of these is the guaranteed 2% accuracy range. So for a 45 lb plate, you’re going to be within 44.1 and 45.9 lbs. And of course most often well within that. For 10 lb plates it’s even better, 9.8 lb to 10.2 lb. 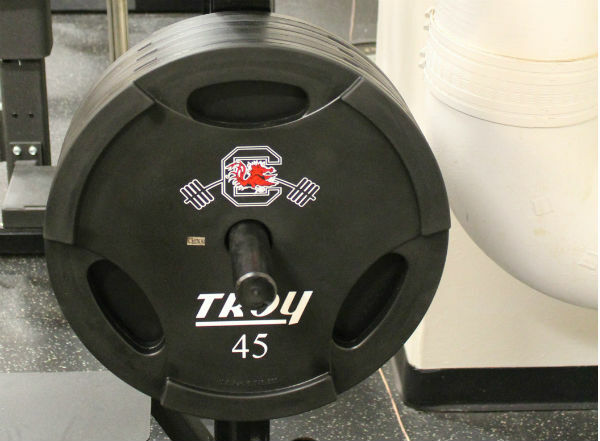 Being a pound off might not sound like anything worth worrying about, but if you load two 45 lb plates per side, and the left ones are 1 lb heavy and the right are 1 lb light, you’re unbalanced by 4 lbs. Some cheaper weight plates like Troy’s economy plates we also list here might be as much as 5% off, or even more, giving you a 10 lb imbalance. The 2% accuracy also comes into play when you’re recording your lifts and are trying to push past a plateau where 5 lbs is a big deal but you don’t always use the same exact plates. 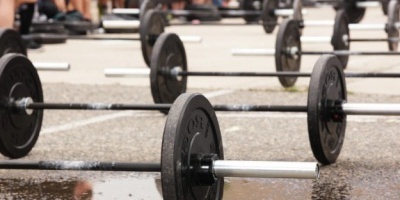 It messes you up when you don’t actually know what you’re lifting. I remember once there was an issue with the coating on a few plates a customer received. It wasn’t a shipping damage issue. Troy does cover things like that, and I had them send out replacements. It worked out just fine. Anyway, whether you order from me or any other Troy dealer, you won’t have an issue being stuck with a bad run of plates. They take care of it. These are machined around all the sides and edges. Sometimes when you have to make a new mold for the casting after so many uses (which is the nature of molds) you end up with plates that aren’t exactly the same as the previous ones. Machining mitigates that issue, because they’re all made a little large and then machined down to the right size. The extra step and the wasted iron they grid off is why these plates cost a little more and how they can be so accurate. Realistically there’s no way to advertise better than 2% accuracy with any cast iron material unless you’re planning on tossing a lot of them. The serious super-calibrated plates out there with mere grams of weight variation are made from steel or from rubber (bumper plates), both of which are easier to get a consistent weight out of for the given dimensions. Here’s Alan Thrall of Untamed Strength enjoying these plates for a 600lb deadlift. These are like the classic York weight plates from the mid- and late-20th century that are all over the place. York still makes one a lot like this too. 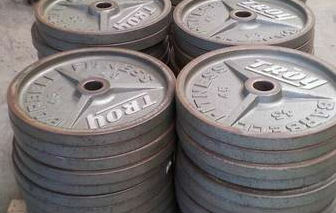 Troy knew what they were doing when they made the 45 lb plates to a perfect 450mm diameter. That’s the IPF diameter and what people want for deadlifts. For other lifts it really doesn’t matter, like if you’re racking it on a weight bench, power rack or squat rack. I mean, you can do cleans with these too, if you have the balls to without bumpers. Dropping iron is a gamble. And loud. You don’t want to be using any grip plates if you’re dropping the bar during deadlifts. The holes in them weaken the structure, and they’re more likely to break. These aren’t bad for deadlifts, with the solid design and wide flange to help absorb the impact over a wider area. Ok, now that I mention that part about cleans and iron plates, I have to post Rip’s amusing video about doing olympic weightlifing cleans with iron plates, just for kicks. Grip holes, urethane coating. So these are Troy’s top-of-the-line plates. Sso the most expensive. I swear I’m not top-loading this list with the most expensive plates on purpose. I guess I just sell to a lot of commercial gyms and personal trainers. It lasts longer than your frail human body. Rubber degrades. Rubber can be worn away by scraping and pounding, ie: what you do with weights. So I guess urethane is just an easy sell. People ask me whether the rubber weights will last, and I always say they last a couple years in a high use environment before they really start looking bad, or longer if they get treated better, but urethane just holds up to almost anything, so if you want the best, there you go. These and anything else with the “Troy” lettering on it is guaranteed with 2% of the marked weight, just like the premium plates above. See above for where I went into detail on that. These plates also have a questionable interlocking feature. More on that at the bottom of this article. I don’t see it as a plus. It’s not bad, but anyway, see below where I talk about the other plates with this same feature, the GO-R and GO. As far as these go, the urethane coating is what redeems it. Now is maybe a good time to bring up the manufacturer’s warranty. The urethane plates are guaranteed for 5 years against defects. The rest of the plates here are a year, 90 days, or even 30 days. I have NEVER had a customer request a warranty replacement on weight plates beyond when they first receive them and there’s damage. So these warranties aren’t really something you plan on using, even though you could. Like with most products, the warranty is just an indication of how long, at the absolute minimum, the manufacturer expects the product to stay good, so they don’t have to do warranty replacements. With weight plates that would mean how long Troy expects the finish to hold up, at a minimum, under constant use. They could probably extend this 5 year warranty for urethane products out to 20 years with no consequences, but I don’t know, whatever. See, I told you I’m not intentionally top-loading with the most expensive ones here. The ultra cheapo ones come in at #3 most popular. There’s not much special about these. They’re made to be priced as low as possible while maintaining a decent level of quality. 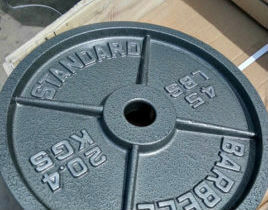 They’re the plates included in some starter 300lb olympic weight sets. Grey (O) and black (BO) finishes. Technically these aren’t “Troy” plates. Troy markets these under their USA Sports brand, which is actually their corporate name too. USA Sports is their lowest-end brand. Not bad stuff, just usually cheaper items like regular hex dumbbells, these plates, most cable machine attachments, things like that. The USA Sports items only have a 30 day warranty. 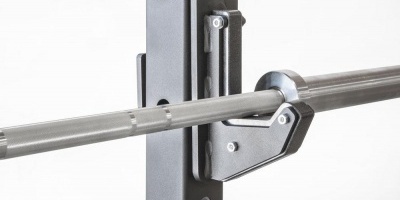 They’re the thinnest plates you can get, so they actually are ideal for fitting more weight on a bar if that becomes a problem. For most of us that’s never an issue, but with olympic dumbbell handles it’s a problem when you get near 100 lbs per dumbbell. With these plates you can load a 18″ olympic dumbbell handle to 130 lbs (twelve 10 lb plates + a 10 lb handle + room for collars to hold them). So these plates are basically the lower-quality grip plates between the two cast iron (non coated) grip plates they have. The others are below. The “VTX” part tips you off. This is Troy’s mid-range line of equipment. Not so high end they want to put the Troy logo on it, but good enough for their VTX brand. It’s kind of smart, when you think about it. It protects the value of their Troy name. I’ve sold tons of these, nearly as many as the premium ones above. The grip holes obviously are the reason they’re so popular. You can grab a couple plates in each hand that way. I don’t know, it saves time. I get lazy. I know I’m not the only one. 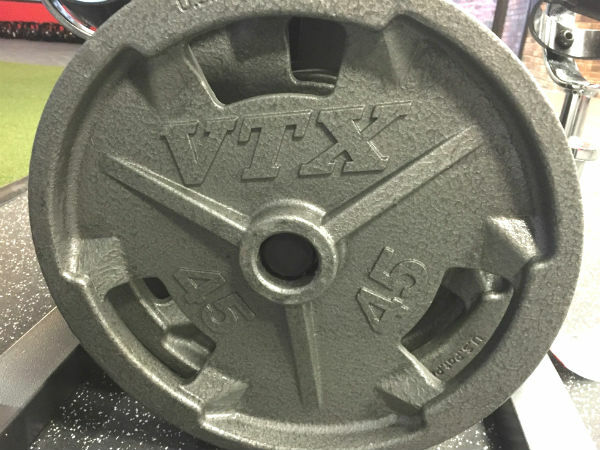 I had a conversation with my guy at Troy about their accuracy guarantee on the VTX line of weights. Their website says 3%, but the inside scoop is it’s gotta be close to 4% off before they’ll replace anything. So that’s the number I’m going with, 4%. These have grip holes like the other VTX plates. The VTX rubber coating has a rougher feel to it than the Troy coating. Is that bad? Not really. There is a bit of a rubber coating seam on the edges (I don’t know how that works… I don’t think it’s from the casting), but I feel like someone would have to be deep into OCD to have a problem with that. I have a bunch of these plates in 10lb that I use along with bumpers and that I had used in the past on olympic dumbbell handles. My reason was the rubber coating was quieter, and that way I didn’t feel so self-conscious about disturbing other people as I clanged weights around. So I like them just fine. So speaking of noise the other thing that cuts out the noise is the bumper plate style steel hub. Bumper plates require it so you don’t have to try to slide a rubber against a steel bar, but with these it’s one of those hit-and-miss design peculiarities that in this case, for me, is a hit. The thing is, a large portion of olympic bars noawadays have lightly ribbed sleeves so the plates stay on better without collars and so the collars hold a little better too. This means you get a loud “zzzzzziiiiiiip!” sound as you slide them on. Maybe it’s just because I’m noise sensitive, but I like the steel hub because it’s smooth enough that you don’t get that noise. The Troy GO-R (rubber coated) and GO (exact same casting, but enamel finished) plates have a weird interlocking design. I don’t get the point of interlocking plates. I talked with my contact at Troy about it, and she said it’s so you can load more weight on the bar. I took the explanation as the best they had, but afterwards I’m like, What? That makes no sense. What’s that Native American saying about cutting a foot off one end of a blanket, sewing it to the bottom, and having a longer blanket? That sums it up. She also said it helps the plates spin together. When is the plates not spinning together a problem? When does this happen? These are like the classic example of a unique product fixing a problem that doesn’t exist. So I don’t like them. The design is dumb. The rest of the plate features are fine. They fit snug. The rubber finish I found is smoother on the Troy plates and dumbbells than on the VTX ones. Different kind of rubber. And I like grip holes. I just can’t get past the interlocking tabs. I have a pair of their BO-SBP bumpers that have this feature too. I prefer their VTX bumpers, which are a normal bumper design, tried and true.